Dedicated exclusively to preparing students for the professions of architecture, art, and engineering, The Cooper Union has an enrollment of approximately 1,000 undergraduate students and was the first college to publicly declare a policy of non-discrimination. Each year approximately 225 innovative, passionate young minds enter the school and undertake an active, demanding course of study in their field. The Cooper Union offers students a gift of possibilities—an annual half-tuition scholarship currently valued at $22,275—and the opportunity to engage and join a unique, committed, and dynamic intellectual community. Peter Cooper purposefully created an institution that would admit students solely on merit. He opened the doors of the school to the downtown neighborhoods, welcoming immigrants who had demonstrated academic excellence but lacked the financial means necessary to gain access to higher education. The School of Art educates artists and designers in the broadest sense, both as creative practitioners and enlightened citizens of the world who are prepared to question and transform society. Central to the school’s philosophy is the advancement of the artist’s role in initiating critical responses and alternative models in relation to prevailing forms of cultural production. Students who are serious about developing an art practice and embracing a rigorous curriculum that fosters connections between disciplines and between traditional and new media are encouraged to apply. Through a highly selective admission review process, approximately 7% of the students who apply to the School of Art are admitted. Admission decisions, made solely by the faculty of the School of Art, are based on visual responses submitted for the Hometest, a portfolio of recent work, and a questionnaire that serves as a one-way interview. Students in the School of Art are assigned studios beginning in their sophomore year. The studio experience affords the opportunity for the development of an individual artistic vision, along with collaboration and experimentation within an intimate community of artists. Along with individual studios, the classrooms, shops, and labs of the School of Art offer outstanding facilities for a visual art and design education. Students working with film and video can access cameras, production equipment, and editing tools in multiple formats. 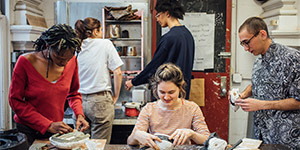 Extensive printmaking facilities, a unique metal type shop, and both chemical and digital photography labs allow students to explore historic and cutting-edge methods of image production, while the sculpture shop accommodates wood and metalworking, casting, and other media. Before graduating, fourth-year students in the School of Art publicly present their work in one of the School of Art’s dedicated exhibition spaces. Senior projects can be solo or collaborative, site- or institution- specific, encompassing a range of traditional and alternative exhibition models. There are no “majors” in the School of Art. Instead, all students take a series of prerequisite courses in their first year in order to prepare them for study in all the disciplines offered within the curriculum. Through exposure to a variety of two-, three-, and four-dimensional projects, students are introduced to the specifics of visual and spatial phenomena and to concepts, principles, and techniques of the visual arts. 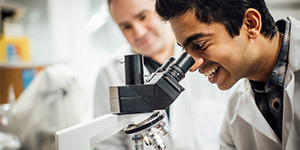 After the first year, students begin to cultivate and pursue specific concerns in depth through advanced course work and independent study—designing their own curriculum with the support of resident faculty and the fresh insight of visiting faculty. 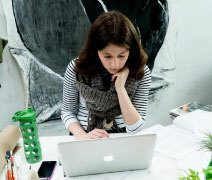 While many international artists, curators, and critics visit the School of Art each year to teach, lecture, and visit studios, our exchange programs allow for study at renowned schools of art in 10 countries, including Slade School of Fine Art in London, Ecole des Beaux Arts in Paris, Bezalel Academy of Arts and Design in Jerusalem, and Kyoto Seika University. Several international students study at the School of Art by reciprocal agreement each semester, enriching classes, critiques, and the entire community with new perspectives. We believe that in a world of increased specialization and professional fragmentation, artists and designers with a wide range of experiences are uniquely prepared to meet the diverse and rapidly changing professional challenges confronting them after graduation.